Okinawa residents again overwhelmingly rejected the landfill for the construction of a US military base at Henoko in a prefecture-wide referendum on February 24. Repelling the various levels of pressure, the referendum was successfully held with all municipalities participating. We express our sincere respect for the residents of Okinawa. Okinawans have many times rejected the construction of a new US military base at Henoko in the various levels of election as well as prefectural people’s rallies. Denny Tamaki’s landslide victory in the September 2018 gubernatorial election was still another expression of Okinawans’ opposition to the base construction. Nevertheless, the government led by Prime Minister ABE Shinzo refused to honor the Okinawans’ will by explaining away that the election was fought over a variety of issues and is continuing with the illegal military base construction. But no one can accept such an argument. The number of votes cast against the landfill was 434,273. That is more than what Tamaki received in the gubernatorial election and accounts for more than 70 percent of the votes cast. A prefectural ordinance provides that, if a quarter or more of the eligible voters reject the landfill, the governor is obliged to honor the result and report it to the prime minister and the US president. The result clearly cleared the benchmark. The government must take the result seriously and completely halt the landfill work at Henoko for a military base. It also should begin negotiation with the United States demanding that the US Marine Corps Air Station Futenma (in Ginowan City) be closed and dismantled without condition. The government continued dumping soil and sand in disregard of growing opposition, clearly trying to show that work is making progress and force people to give up protests. But the referendum result shows definitely that the residents of Okinawa are far from giving up. The planned base construction is facing multiple problems that are difficult to solve. 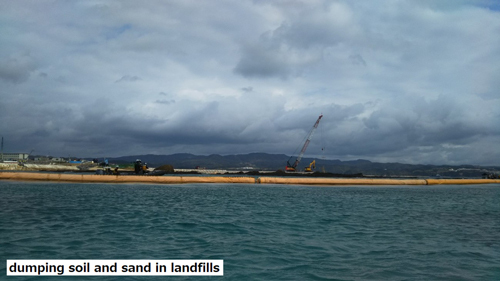 The government explains that 77,000 sand compaction piles will be driven into seabed to solidify the soft soil on the side of Oura Bay. But no one could tell how enormous cost it may incur and how long it will take. To begin with, the Okinawa governor maintains the position of not issuing a permit for such changes in engineering methods for soil improvement work. There are no prospects in sight for future work. It is clear from various angles that it is possible to block the construction of a new US base at Henoko. The recent prefectural referendum was about enabling affairs of Okinawa to be decided by the residents of Okinawa. It was a struggle to let democracy and local autonomy guide. 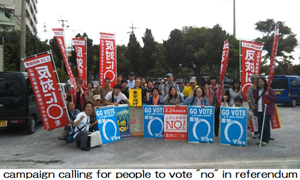 In the referendum campaign, people from all across the social or political spectrum joined forces to demand the realization of what all municipality heads and local assembly chairs in Okinawa petitioned for Okinawa, bringing a victory for democracy and local autonomy in Okinawa and for the will of the majority of Okinawa residents. Zenroren has promoted a campaign at each industrial or local federation in support of and in solidarity with Okinawa prefectural people. We are determined to further broaden this struggle based on what has been achieved in the prefectural referendum to stop the construction of a new US base at Henoko.